2013-01-20 New firmware 0.2, improved pulse timing and two new commands, "Servo Enable, se" and "Servo Disable, sd". 2013-01-16 Made new HW and working on SW for version 3 featuring an ATmega8. More info at the new page for this card: here. 2012-09-10 Got components for 10 boards. Servo connector 90 degree angled. This is version 2. 2012-08-15 Code cleaned a bit. Version 0.1 released!! 2012-08-12 Memory problems yesterday. Code reworked, close now! 2012-08-11 Software working well now, first release tonight? 2012-08-09 20 PCBs on their way here. First youtube movie showing prototype. 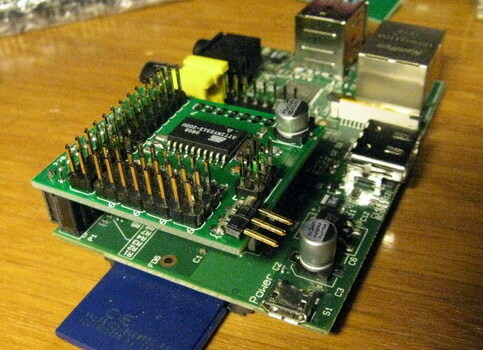 It's a small board that connects to a Raspberry Pi and allows you to control up to eight RC servos (or ESCs) via the serialport in the GPIO port of the Raspberry pi. The commands are simple ASCII. The above youtube video gives a nice explanation. For more information read the manual in the Download section. The 2x13 pin header on top is a pass through if you want to connect other cards using the GPIO-port. If you are into AVR-programming you can reprogram the little MCU on the RPi Servo board and make the card do whatever you like. Maybe read 8 temperature sensors and send the values as ASCII on the serial port? The card also has a 7 pin connector (unmounted) that exposes 5 GPIO-pins of the ATTiny2313 CPU, +5V and GND. They have no function with current firmware, but could be used for what ever you like if you write your own firmware. The software is GPL and by reading the code it should be fairly easy to figure out the connections and design your own card. If you don't want to do that I will sell my first batch of 20 cards. Paypal seems to work. Contact me via email or just send the correct amount to paypal: adent@chroma.se and add your address and what you want as a message! 2013-01-21 Example C-code to drive the servo board from RPi. 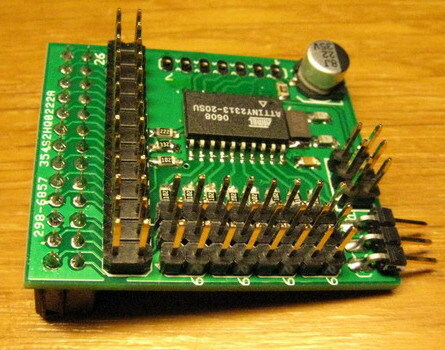 The Servo board uses an AVR MCU: ATtiny2313. A Google search tells me that people have successfully modified avrdude (program to reprogram an AVR) to use the GPIO-pins of the Raspberry Pi. Since the Servo Board passes all GPIO pins of the RPi through, a simple jumper cable could be use to reprogram the servo board if you want to modify the SW for your own needs. On second thought, the AVR runs on 5V so the MISO line will need two resistors to make it 3.3V.